If you’re an athlete or if you’re someone who just wants to get in shape, a GPS watch can be very motivating. It can tell you how fast you’re moving, your heart rate, how many calories you’ve burned and much, much more. Not only can you see these metrics in real time, once you’re done working out you can upload the data to an online platform where you can keep track of your progress over time. It's almost like having a personal trainer. Here are five great sport watches that I put to the test, most of which work best with a heart rate sensor that you strap to your chest. This watch, which is relatively thin (13.7 mm), light and easy to configure and use, is ideal for runners and cyclists but not swimmers. While you can use it in the rain and could even shower with it on, it’s not designed to take the kind of wet barrage that comes with lap swimming. I ran with Polar RC3 GPS for several weeks and found it did an admirable job of tracking my speed, heart rate, calories burned, and route. After each workout the watch gives you a summary of how you did—things like how far you went, your fastest speed, the number of calories you burned, your average heart rate and more. It also gives you an interesting number called “Running Index,” which reflects aerobic fitness and how efficient you are at running. When I first started running with the Polar RC3 GPS my Running Index score was abysmal. But as I got more into shape the score gradually increased, which I found quite motivating. 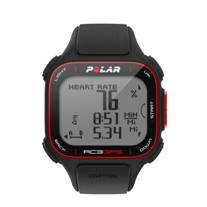 The Polar RC3 GPS also will show you the heart rate zone you’re in—an important metric for people trying to lose weight or increase their anaerobic fitness—go too fast or too slow and you’ll be less able to do either. You can also turn on a ZoneOptimizer feature which reads your heart rate variability at the beginning of your workout and adjusts the limits for your heart rate zones according to how much your body is ready to train. At the end of your training session the watch tells you how much time you spent in each zone. The Polar RC3 also automatically saves your starting location and will guide you back to it at any point during your route with a large arrow that tells you which direction to head—a nice feature, especially if you’re traveling or otherwise in unfamiliar territory. The watch lets you track running, cycling or other things such as working out at the gym. For activity in which GPS data isn’t helpful, such as using a treadmill or lifting weights, you can turn off GPS; Polar says doing so will give you about 1700 hours of battery life compared with 12 hours with GPS enabled. A USB power cord connects the watch to your computer for charging as well as uploading data to PolarPersonalTrainer.com which lets you see your training route on a map, get detailed results from your training, share results to social networks, pose fitness challenges to friends or strangers and more. My only complaint is the eight training views on the watch aren’t customizable, meaning you’re stuck with switching between them if you want to see certain metrics during your training session. For example, I’m most interested in seeing my heart rate, current pace and number of calories burned. While I can get all that data by switching between training views, it’s not all located in one spot. Optional accessories include a Polar s3+ stride sensor which helps runners improve their technique, as well as WIND sensors for cyclists that measure cadence or speed. Whereas the Polar RC3 GPS has a bit of a retro-80s look to it, the Suunto Ambit 2’s aesthetic leans toward the future with a brushed metal and porthole-shaped clock face frame and five substantial buttons. A USB power cable clips onto the back of the watch and connects the device to your computer for charging as well as for customizing the device and uploading data from it via software called Moveslink, which connects you to Suunto’s web app, Movescount. It’s a sophisticated GPS instrument you can pair with a heart rate sensor as well as foot and bike PODs to get a wealth of information about your sports performance in addition to things like your altitude, the ambient temperature and barometric pressure. You can also swim with the Ambit2 and it will track things like swimming time, pace and distance, as well as the count, rate and efficiency of your strokes. It works for free style swimming outdoors but can also track metrics indoors such as pool length, laps and total distance. The Ambit 2 also can determine your swimming style which you can analyze later in Movescount. Mountaineers, trekkers and anyone who likes to hang out in the wild will appreciate the Ambit2’s GPS capabilities. Not only does it give you your latitude and longitude coordinates, you can set points of interest then navigate to them later through a function that shows you how far away they are as well as which direction to head in order to get to a POI in a direct, as-the-crow-flies route. But what I appreciated most about the Ambit2 is how much you can customize it. Within the Movescount app you can change and add views for a slew of various sports. For example, I don’t care much about altitude, but I’m keen on how many calories I’ve burned. I found it marvelous to be able to edit available screens so that I always have the latter and never the former taking up real estate on the watch face. As part of that customization, you can also choose from more than 1,000 apps that can work within the watch and do extra tricks, such as show you how things like how fast you’re skiing downhill or the oxygen level at a particular altitude. As for knocks, I found some of the numbers on the watch a bit too small and because it’s such a complex instrument it takes a bit of playing around with to figure out how to work it. Otherwise, it’s a fantastic multisensory device if you’re willing to pay a premium for it. Price: $500 for the Ambit2, $550 for the Ambit2 with heart rate belt, $600 for the Ambit2 Sapphire and $650 for the Ambit2 Sapphire with heart rate belt. Available at various sporting goods retailers. TomTom recently released a new line of GPS watches for runners, cyclists and swimmers that feature a large display and easy-to-read numbers, one-button control and slim form-factor that measures only 11.5 mm thick. In comparison, the Suunto Ambit2, the most substantial watch I tested, measures 17.5 mm thick. The TomTom Runner is, obviously, for runners. It pairs with an optional heart rate monitor to track training zones for weight control, performance or speed and has an indoor tracker feature that counts strides to measure pace and distance on a treadmill. You can automatically upload data from the watch to online platforms such as TomTom MySports, MapMyFitness, and RunKeeper, where you can analyze and share your stats. TomTom Multi-Sport does all of that but also allows lets you track your distance, time, speed and other metrics when you cycle or swim. 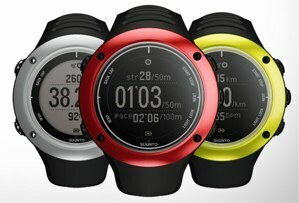 It comes with a bike mount, cadence sensor and built-in altimeter to track elevation, ascent, descent and grade. The swimming motion sensor measures laps, strokes, time and speed, and calculate a SWOLF score that reflects how efficiently you’re swimming. A couple of standout features are worth mentioning. First, there’s a cool “race yourself” feature that takes advantage of the way TomTom records where you’re moving and how fast. As you’re going along the watch will tell you where you are compared to your best or last activity so if you’re 120 feet behind where you were at the same point in the comparative run, bike or swim, you’ll know it. The watch face—which pops out of the watch band for charging, uploading data to online platforms or mounting on a bike—displays large, easy-to-see numbers so you can spend less time actually looking at the it. And instead of pushing buttons on the side of the watch face you navigate settings and features with a square below it that houses the GPS receiver. Vibration is another nice addition. Every time you navigate settings or features you get a mini vibration which I found somehow psychologically pleasing. And when the alarm goes off not only does it beep, the watch shakes considerably making it hard to ignore. I also liked how it looked on my wrist. Of the watches I tested the TomTom watch had the sleekest profile. The Suunto Ambit2 and the Polar RC3 both looked quite large on my small wrist. 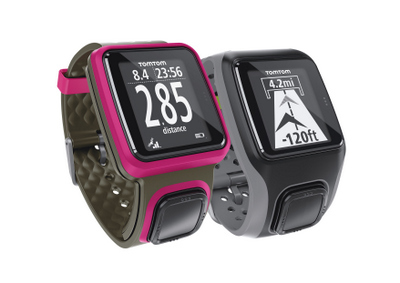 Price: $169.99 for the TomTom Runner and $199.99 for the TomTom Multi-Sport. The TomTom Runner is available now at Amazon; the TomTom Multi-Sport will be available there later in July. 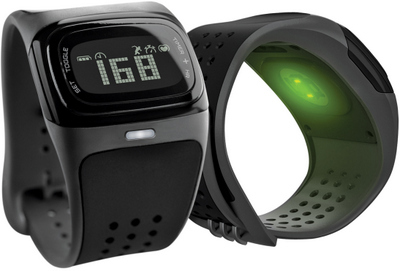 You can get a bundle that includes a heart rate monitor for $219.99 from TomTom. The Mio Alpha is not gps-enabled on its own and lacks many of the features other watches profiled here. But it has a couple of features that makes it great for sports enthusiasts. First, if you don’t mind working out with your smartphone you can get GPS tracking and other useful features if you have an iPhone 4S or 5 with apps such as MapMyFitness and RunKeeper installed. As for Android, Runtastic Pro is a $5 app you can pair with the watch as long as your phone is Bluetooth Smart 4.0 enabled (check here to find out if it is). By pairing your phone with apps like these you can use your phone’s GPS capabilities to map and record things like time, distance, elevation, calories and more. But accuracy isn’t a problem with the Mio Alpha. It uses two light beams and an electro-optical cell to sense the volume of blood under your skin and determine heart rate. When I ran wearing it with either the Suunto Ambit2 or Polar RC3 GPS on my other wrist paired with a chest strap heart rate sensor, the Mio Alpha was almost always only one or two bpm below or above the other device. Another thing I appreciated about this one was the silicone watch band—it’s soft, flexible and stretchable so you can get a good contact between the wrist and the sensor without squeezing the heck out of your arm. It also lets you tack the end of the band down into itself with three little pegs, giving the watch a relatively flat profile. A flashing light and beeps give you heart rate zone alerts. You can either use the default target heart rate zone, which is between 110 bpm and 130 bpm, or set your own. The watch beeps once when you’re not exercising in your target zone and twice if you’re 10 bpm out of it. A green flashing light means you’re in the target zone, while a red flash means you’re working out above your upper limit and a blue flash means you’re below your lower limit. Mio says you can swim with the Alpha although heart rate accuracy might be reduced in cold water and you shouldn’t dive with it on or push its buttons under water. Price: $199 at Amazon or alphaheartrate.com. where is the fifth one? The TomTom Runner and the TomTom Multi-Sport. I run for around 5 - 10 miles a day, this is perfect since it is light and affordable. Would recommend this to anyone!